There are a lot of helpful and trustworthy folks in the insulator collecting community. But some insulator sales are NOT legitimate. Not every person selling insulators is reputable. There are those who would take your money (and lots of it!) for items that are considered worthless within the hobby. 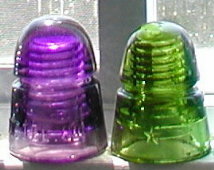 If you see an insulator in an incredible color or amazingly undamaged shape, be skeptical. 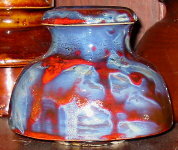 Don't spend big bucks on a piece unless you know you are getting the real thing. Are they real or are they Exterior Acrylic Latex-enhanced? 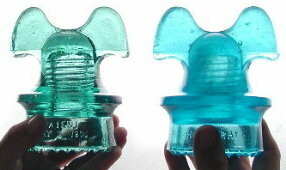 These are usually common genuine insulators that have been changed to a different color from the original. This can be done by many methods including painting, staining, dipping, tinting or irradiating. 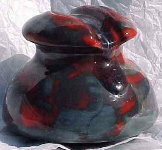 This is usually done to achieve a more desirable color. 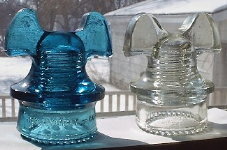 Such colors may be those that real insulators were made in but which are more rarely found, or they may be colors that were never seen in genuine insulators. 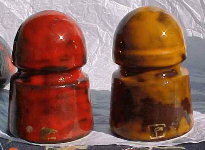 TIP: BRIGHT RED insulators were never made by real insulator manufacturers. These are essentially "after market" pieces. They have been made by creating a mold of a genuine piece. They may be found in various materials, including glass or resin. They may be found in a dazzling array of improbable colors, as well as colors that may seem genuine. These can be nice for the purpose of filling in a hole in one's collection, but they should not be expected to fetch as high a price as the genuine article would. It is also important that they be appropriately marked as reproduction items. Let's face it, advertising is advertising. 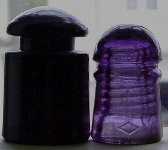 Some unscrupulous or ignorant sellers will try to make the insulators they are selling sound like they are "rare" and "scarce." They would have you believe that they are worth a great deal more than their true value. They want to make a buck. 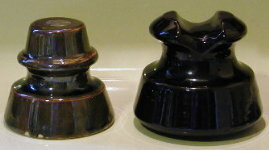 Many insulators are somewhat "old," but some are very common. The book value on the commons is typically about $1-$5. Know what you are buying before you shell out too much money for a common piece. Don't waste your money. Be an informed collector! As much as we may wish they were real, some odd or wildly-colored pieces may not be. 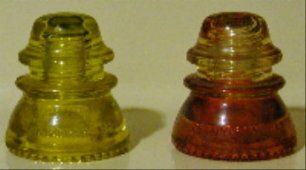 Can you tell which of these insulators are real and which are fakes? Did you spot the fakes? Check here. To learn more about insulators that may be more or less than they seem, read Mike Guthrie's great article.